Laurel Cottage is an annex to The Laurels, a Victorian Villa built circa 1875. The property is accessed via a shared driveway providing off street parking. A gated courtyard entrance is equipped with garden furniture for 4 and provides a secluded location for al fresco dining or just enjoying a relaxing drink. Clothes lines are discretely located to the side of the building. The courtyard provides access to the Cottage through a front door, opening into the lounge/diner, adjacent kitchen and ground floor bathroom. Stairs lead to a landing that services the 2 bedrooms on either side. In 2015 Laurel Cottage was completely refurbished and is maintained to the highest standard to ensure visitors have the best experience during their stay. The lounge has 2 sofas with seating for 5, and WiFi and a 40" 4k Ultra High Definition SMART TV giving Freeview and access to on-line apps such as your own Netflix and Amazon accounts, News and Sport as well as catch up players like BBC iPlayer and ITV Hub. Great if you want to relax at home and keep up with your favourite programmes with quality viewing whilst on holiday. A dining table and 4 chairs enable eating at home as well as somewhere to work with a laptop if required. Heating is controlled using a Hive system initially set to a schedule but managed via the lounge thermostat. The kitchen has a fridge/freezer, oven, microwave, hob, washing machine and dishwasher and is well equipped with utensils and cutlery. Visitors are welcomed with essentials of milk, tea and coffee. The master bedroom has a king size bed, a double mirrored wardrobe with hangers, a chest of drawers and Freeview TV. Bedroom 2 has 2 single beds and a mirrored wardrobe. Laurel Cottage is family friendly. Torbay is our first step towards escaping London life to somewhere that combines the benefits of beautiful countryside and sea, enabling us to enjoy boating, walking, theatre, history and numerous events that are held locally throughout the year. The Laurels captures the elegance and grandeur of the Victorian era. It is situated within walking distance to all amenities but enjoys tranquillity, fresh air and convenient access to business and holiday locations. I bought The Laurels and Laurel Cottage with plans to restore the main house to its full glory over the coming years. In 2015 Laurel Cottage was completely refurbished and is maintained to the highest standard to ensure visitors have the best experience during their stay. For Xmas, to ensure guests enjoy the festive season, the lounge has a Xmas tree and decorations to ensure the occasion can be properly celebrated away from home. All interests are catered for within easy striking distance of Laurel Cottage. Access is good with motorway, train and air services enabling quick travel for either holiday makers or business travellers. Once here, you cannot fail to appreciate the good quality air, the relaxing tranquil location and the numerous amenities close to hand whilst enjoying the well equipped and maintained Cottage as a base. The bathroom is equipped with a low level bath, over bath shower, toilet, wash hand basin, heated towel rail and cupboard space. Complementary bath/shower gels are provided. Central heating is provided and controlled by a Hive system. A heating schedule is pre-programmed for convenience. Please request a copy of the house rules. Sheets, pillows and pillow cases are provided. A washing machine is provided in the kitchen. For drying laundry there are two washing lines with pegs to the side of the property via the courtyard. Also a clothes horse is kept under the stairs. Off street parking is provided for up to 2 cars. Free parking is also provided in Hunsdon Road. Wi-Fi connection is available, connection details provided in folder kept in the lounge. Maximum download speed of 52MB. Towels are provided, however beach towels are not and visitors are requested not to use towels from the Cottage for this purpose. The living room has a 2 and 3 seat sofa, coffee table, floor rug, 40" 4k Ultra High Definition SMART TV, WiFi and games. A table and 4 chairs are also provided for guests wishing to eat at home. A 4 slice toaster is provided. A welcome pack is provided comprising a bottle of Proseco, milk, coffee and tea. Dishes and utensils to enable catering for 4. The kitchen has a fridge/freezer, oven, microwave, hob, washing machine and dishwasher and is well equipped with utensils and cutlery. Visitors are welcomed with Proseco, milk, tea, coffee. A dining area is available in the lounge with a table and 4 chairs. Additionally a high chair is kept under the stairs. Laurel Cottage has its own courtyard equipped with a table and 4 chairs. The courtyard provides furniture for al fresco dining for 4. Excellent - but unless very fit you do need your car! Excellent property and we appreciated the bottle of Prosecco to celebrate our Anniversary thank you! Just a note of caution for others that unless you are quite fit the roads around the property are steep and you may find it easier to drive, even though Torquay harbour is not far away! Oh - and the loo/bathroom is on the ground floor, although this wasn't an issue for us. Would recommend. Lovely house, everything we needed and decorated gone high standard. Locality to the harbour was great where there are loads of restaurants and bars. Loads for the kids to do. Laurel cottage is a lovely property with everything you need to feel comfortable and enjoy your stay. Richard and Joanna are very welcoming. We really enjoyed our holiday. The house is near the town centre and the beach so you don't need to drive if you want to explore the town. Thanks for the lovely stay! Richard and Joanna were so friendly. We arrived to lovely bottle of wine in the fridge, tea, coffee and milk. The cottage is tastefully furnished with very comfy beds. 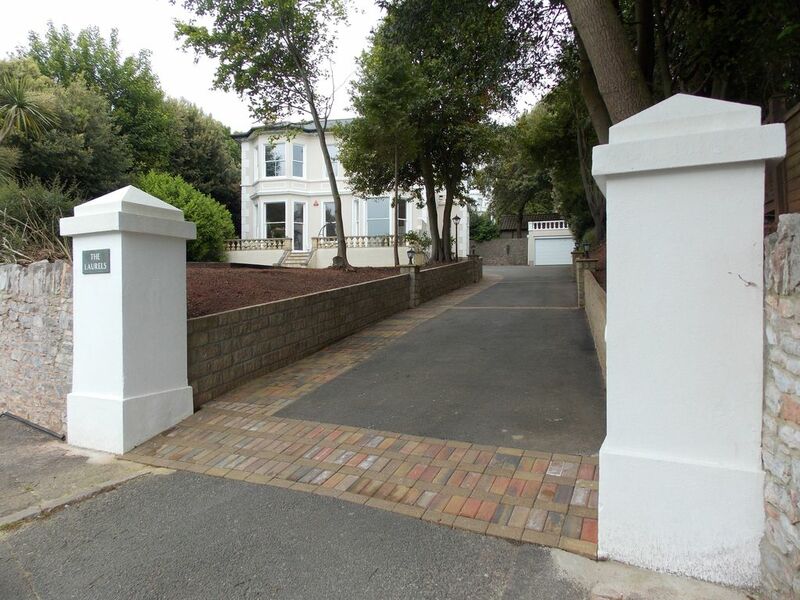 Very nicely situated with easy access into town/seafront. We had a car but you could walk it. There is parking at the cottage. We would certainly recommend and if we return to visit Torquay again we will without a doubt hopefully be able to stay here again. Really lovely cottage. The cottage is done to the very finest quality. And it is a treat to stay there. We stayed in Laurel Cottage for 4 nights during half term. The cottage is in a very quiet part of town but only 10 minutes walk from the harbour and town centre (be aware the walk back is quite steep!). The cottage is well looked after and very clean and has everything you need to be home from home. Thanks for a great stay!